Talent, creativity and innovation run deep in Alabama, and it’s not hard to wrap a bow around them this holiday season. Across the state, entrepreneurs, artists, bakers and other makers are selling their wares. Finding a special Alabama-made gift to fit any budget is no problem, but narrowing it down might be. Alabamians fashion everything from cars to candy, and our 2016 Made In Alabama Gift Guide offers just a sampling of the one-of-a-kind presents you can share this Christmas. Last year’s list featured handmade glassware, vintage jewelry, candles repurposed from used wine bottles and a high-powered motorcycle with a price tag that topped $100,000. Al Smith produces veggie choppers and other products at Pequea Valley Forge. Christine Linson is known for paintings depicting her adopted hometown, Fairhope. Gina Locklear's Alabama-made organic socks are known for their striking colors and patterns. A gift basket from Alabama Goods. This year, colorful organic cotton socks, sweet and salty pecan treats and an off road performance pickup are vying for a spot under the tree. Athens blacksmith Al Stephens creates hand-crafted iron work that is found in kitchens across North America. Through his business, Pequea Valley Forge, Stephens makes veggie choppers, pizza cutters, cheese slicers, panini presses and other household items and sells them at stores in the U.S. and Canada. The pieces have an Old World feel and are made to be passed down for generations. A full-time, professional blacksmith for more than 20 years, Stephens also tries to raise awareness of the ancient craft. Earlier this year, he and other Alabama blacksmiths who make up the group, Athens Forge, helped create a World War I memorial that was erected in Ypres, Belgium. A Trussville-based specialty vehicle manufacturer rolled out a new high-performance, off-road pickup earlier this year: The 2016 Black Widow boasts extras including a 6-inch suspension lift system, stainless steel performance exhaust, pocket style fender flares and red ambient cabin lighting. SCA Performance gets vehicles from manufacturers and outfits them with after-market accessories. The Black Widow versions of the Chevrolet Silverado and GMC Sierra represent about 70 percent of the firm’s sales. Prices typically range from $60,000 to $70,000, depending on options. SCA Performance is the former Southern Comfort Automotive, which was well known for its customized vans. The industry, however, is shifting more toward trucks, and the new name reflects the change. Other Alabama auto manufacturers unveiled new offerings this year, too. The Honda plant in Talladega County launched a redesign of its Ridgeline pickup, while the Santa Fe SUV returned to the Hyundai assembly lines in Montgomery. For more than 70 years, Priester Pecan Co. has whipped up salty, sweet and crunchy treats with the signature southern nuts. At the country store off Interstate 65 in Fort Deposit, pecans are sold just about any way you can imagine: plain, roasted, salted, flavored, smothered in chocolate or baked into pies and brittle. Priester’s started as a part-time seasonal wholesale nut business and evolved into Alabama’s largest gourmet handmade candy company. 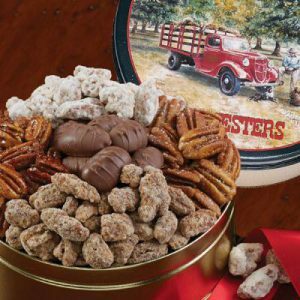 For a taste of all the signature treats, try the Priester’s Favorites Sampler, priced at around $28, and filled with roasted and salted pecans, pecan logs, frosted pecans, milk chocolate covered pecans and praline pecans. From the test kitchen of Gadsden’s Back Forty Beer Co. comes small batch craft beer vinegar, which can be substituted for regular vinegar in any recipe. The makers of Truck Stop Honey, Naked Pig and Freckle Belly and other beers have partnered with chefs across the country since 2009 to develop creative beer and food pairings. Beer vinegar is the result of that collaboration. 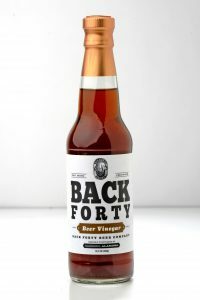 Back Forty offers its own recipe suggestions: Beer Vinegar White BBQ Sauce and Beer Vinegar and Salt Roasted Potatoes. The beer vinegar, available in individual 12 oz. bottles or cases of 12, is produced and packaged by Perdido Vineyards. 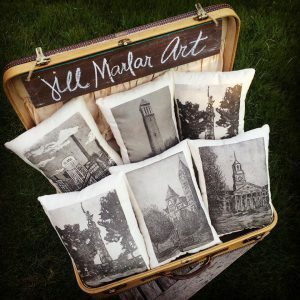 Add a touch of the Magic City to any living space with soft cotton pillows made by printmaker Jill Marlar. Vulcan and Sloss Furnaces are among the Birmingham landmarks featured on the 11 x 14-inch pillows, which sell for around $35. You can also choose a scene from her University Series, such as Auburn’s Samford Hall and Alabama’s Denny Chimes. Marlar specializes in intaglio aquatint etchings, which are hand drawn images etched into metal plate using acids, then hand inked and printed on a wheeled etch press. In the spring of 2014, she began applying her images to fabric to make pillows, and her friends bought them up. These days, Marlar has a partnership with the West Elm store at The Summit, which sells the pillows. They’re also sold at other local retailers, at art fairs and in her Etsy shop. In 2017, Marlar plans to expand her etching images to include other locations around the state and possibly the South. In 1998, Ohio native and artist Christine Linson traveled to Fairhope and fell in love with its southern charm. In the nearly 20 years since, she has built a large following, selling oil paintings, watercolors and charcoal figurative artwork from her gallery in the heart of downtown. Her depictions of scenes around Fairhope and coastal Alabama are especially popular, including large and small prints, note cards and annual Christmas cards. Linson, who held her first solo art show of paintings at age 9, holds an art degree from Ohio State University and also studied at the Cleveland Institute of Art. She has taught art in public and private schools and has sold her work around the world. Fort Payne’s Gina Locklear is wrapping up a whirlwind year of high-profile publicity for her two lines of Alabama-made organic cotton socks. The Zkano brand features bold colors and patterns, while the Little River Sock Mill label has a more sophisticated look with softer notes. Locklear and her crew make socks for any type of foot – men, women and children – at her family’s sock mill in Fort Payne. Their work has caught the eye of Martha Stewart, who recognized the socks with a 2015 American Made Award. The New York Times also featured the business earlier this year. The Alabama Goods store in Homewood can help you gift the best flavors of the state. From a sampling of craft beers brewed across Alabama to locally made kitchen basics like infused olive oils, chutneys, sauces and rubs, there’s an option for every budget. Prices range from the $25 Discover Alabama to the $200 Gourmet Bonanza, and the baskets are packed with cookies, candies, nuts and other snacks. For those with more specific tastes, try the Alabama Jelly Collection, Grilling Sauce Gift Set, Hot Stuff or The Sweet Tooth, all priced at around $40.